Like other plants, lawn grasses can suffer from rust which causes the leaves to look yellow and unsightly. It usually develops in late summer or autumn. What is lawn rust disease? 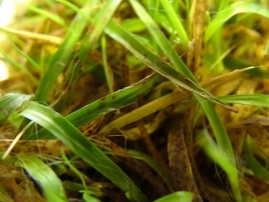 Rust is a common foliar disease of turf. It is caused by various fungi, usually Puccinia orUromyces species. Infected areas may produce huge numbers of air-borne spores. There are no fungicides available to amateur gardeners for the control of rust on lawns. Thankfully, chemical control of rust is usually unnecessary, however, as the symptoms are temporary. Even lawns that are heavily infected in autumn will usually produce healthy growth by early summer of the following year. If unsure would be more than happy to inspect your lawn and advise you. The orange pustules produce summer spores that can be carried for long distances on the wind. They need several hours of surface wetness in order to germinate and infect the leaf. Rust is therefore most prominent in wet summers, and particularly in autumn when heavy dews provide extended periods of leaf wetness. The black pustules produce over-wintering spores, adapted to survival in cold conditions. Lawns lacking in vigour (due to factors such as nutrient deficiency or drought stress) are often more prone to attack. Rust is often very noticeable on long grass or where trees or shrubs overhang the lawn. In these situations the grass is slower to dry out after rainfall or dew.